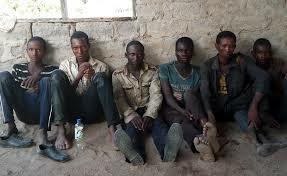 Troops of 707 Special Forces Brigade have arrested 6 herdsmen, caught in the act of farmland destruction in Kwata, Benue State. This is contained in a statement on Sunday by Brigadier General Texas Chukwu, Director Army Public Relations. It explained that troops on patrol in the general area of Kwata Sule on Saturday 17 encountered the herdsmen. After initial interrogation, the suspects were handed over to the police for further action. Similarly, troops on patrol in the general area of Chembe, Tse-Gundu, Tse-Iordye and Shaor settlements sighted two herdsmen on a motorcycle along Kwata Shaor river bank. “Herdsmen abandoned their motorcycle and fled. In search of the general area, one round of 7.62mm special was discovered. “Troops continue to dominate the general area with patrols,” the statement concluded.